The Sarai Programme is excited to host the Delhi pre-event of HillHacks on Saturday, 30 April, 2016. The pre-event will be a relaxed combination of demonstrations and discussions of all things relates to hacking, making, and living in a technology-mediated world. There will be two thematic sessions focused on Art/Design/Technology and Mapping respectively. To RSVP, please send an email to <dak@sarai.net>. Hillhacks is an un-conference held in the lap of the stunning Dhauladhar Himalayas every summer. People from different places, walks of life and lines of thought, come together, to share, collaborate and learn. Hackers talk code. Artists share their creativity. Students join in from schools and colleges to learn new skills. Locals and Globals mix and mingle. 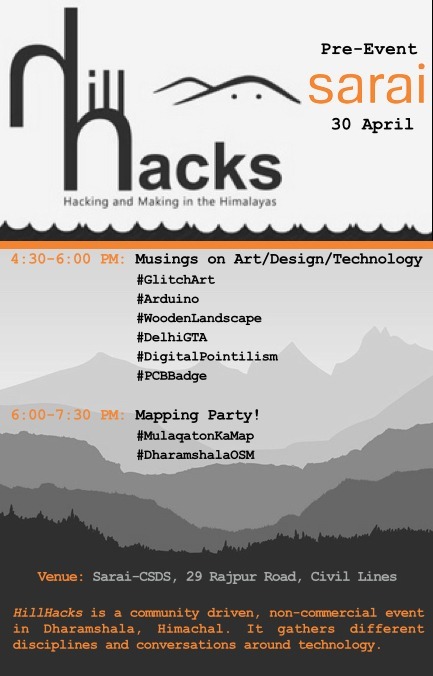 HillHacks provides space and place for various temporary hackspaces with technology, art and education workshops, leading into a conference and maker exhibition in Dharamsala, India. This region in the foothills of the Himalayas is directly affected by a concrete idea of freedom as it hosts the Tibetan Community in Exile. Check the HillHacks website for more. Bring anything that you want to share with other people – from hardware humour to software stories. Extra points for bringing your own Internet dongle.